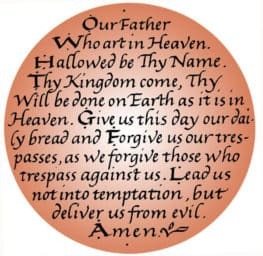 We experience The Lord’s Prayer as a universal healing mantra. (A mantra is defined as a sacred word, sound or phrase which is believed to have a spiritual and psychological power.) And we believe this prayer or mantra is much more about accepting than about asking. In its first two words,’ Our Father’, Jesus describes Gods’ relationship to us, our relationship to Him/Her, and our relationship to each other. In this we hear him saying that we and ‘Our Creator’ are one. This defines our divine relationship as one family, of one spirit, who is the Christ self within us all. The words “Our Father” merge our identity with God’s and with each other. “Who Art in Heaven” directs us to look within. “Holy is your name”, tells us to speak and listen to God within us. The relationships between these attunements and our chakras instructs us to look, speak and listen to our sacred spititual heart. The Spiritual heart is know also as the Seat of our Soul. It’s often referred to as the Cave of Brahma. Of course God is everywhere, in everything, but our third-eye and heart chakra are where God is most accessible to us. If you will pray; speak to God, and meditate listening to God, while focusing with this intent within these two chakras, you may have this divine experience. As we do this it is helpful to be mindful that our purpose is not to inform God; as God already knows. Our purpose is to exercise, develop and strengthen our intention to commune with Our Creator who is the Light of our pure Christed Self. This prayer is about each one of us. It’s about how the Light creates us like rainbows on eight dynamic energy centers or levels called chakras. It’s also about how we ascend through these levels. 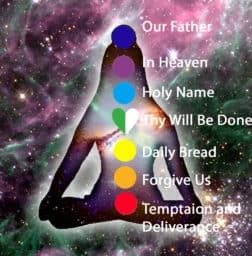 This empowering instruction is clearly revealed by how the eight attunements of The Lord’s Prayer, our eight chakra centers and the original roots of Yoga all beautifully align.Thus helping enhance our individual understanding of our Christed Self. Note: In our image left, the Heart chakra has 2 Colors shown. The green represents our human heart and the white represents our spiritual heart as referred to above. Our Website Members have an abundance of programs and meditative exercises to have their own personal experience of The Lord’s Prayer and much, more. Oracle of the Heart provides a new way of thinking about the the Lord’s Prayer and reveals correlations to the Tree of Life, the IChing, The Ancient Maya’s teachings. Also the Melchizedec Priesthood, the Original roots of Yoga and Sacred Geometry.We invite you to read: Why Join? Or visit Our Store to see whats available without a subscription.